The output of the laser depends on the drive current passing through it. 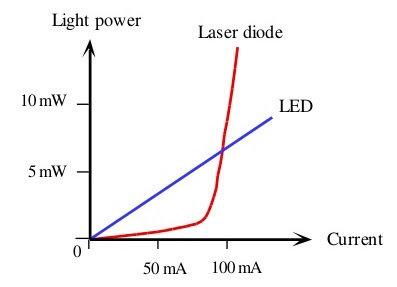 In laser diode operating at low drive current, It operates as an inefficient LED full form, when driving current crosses threshold value, lasing action begins. Here to shown in figure graph comparing optical power of LED operation and LASER operation.